Weekly Summer Events at Dilworth Park Begin this Week! Dilworth Park provides the perfect beginning, middle and end to every Center City adventure. The west side of City Hall bustles with activity, with a new season of weekly events starting May 5. Every Tuesday at dusk, catch Hollywood blockbusters at Pictures in the Park. On Wednesdays, 12-1:30pm, XPN welcomes Live @ Lunch presented by PNC brings the best in local music. On Thursday evenings, get down and unwind with DJs & Drinks at Dilworth Park presented by The Graham Building, 5-7pm. Coming up in June, SIPS at Dilworth Park will swing into the Rosa Blanca Cafe every Wednesday as part of CCD Sips! All events are free. Schedule and programs subject to change. 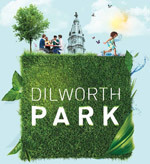 Visit DilworthPark.org for complete schedules and details. Dilworth Park is managed and maintained by the Center City District. Starting May 7, come to Sister Cities Park every week all summer for BYO Thursdays with live music, 5-8pm. Take a seat at one of the tables inside or outside the cafe or bring a blanket and find a favorite spot under a tree or on the grass. Logan Square Café will offer a special summer grilling menu. Sister Cities Park is located at 18th Street and the Benjamin Franklin Parkway. For more details, visit SisterCitiesPark.org. Shop and dine at the more than 100 businesses participating in Philly Loves PAWS on May 20, and 10% of your purchases will be donated to the Philadelphia Animal Welfare Society (PAWS). These proceeds will help PAWS rescue and care for the city's most vulnerable animals and bring Philadelphia one step closer to becoming a no-kill city. For a list of participating businesses, go to PhillyLovesPAWS.org. On May 9, come to Franklin Square and celebrate Asian Pacific American Heritage Month with movie screenings, cultural entertainment, food, and a beer garden. Festival events are free, but tickets are required for Philly Mini Golf and the Parx Liberty Carousel. Food and beverage may be purchased. Terror Behind the Walls is bringing back Party at the Pen: The Masquerade, May 15-16. Expect luscious libations, mind-blowing beats, and intriguing adventures, as well as some new and unique talent. Gates to some of the dark, otherwise off-limits corridors of the abandoned prison will be momentarily unlocked. When a masked gentleman offers his outstretched hand and asks, "Are you feeling adventurous?" make haste and follow him on a thrilling journey through Eastern State Penitentiary's storied past. Dance. Drink. Explore. Tickets required. Saint-Gobain, one of the world’s largest building materials companies, commemorates its 350th anniversary with “Future Sensations” on The Oval, May 30-June 6. It’s an immersive experience with five distinct ephemeral pavilions. They will take visitors on a sensory journey of science, storytelling and art, celebrating the past three and a half centuries and offering glimpses into future innovations. Philadelphia is the only US stop in its world tour. Square 1682 is offering a Power Hour Lunch Monday-Friday, 1:30-2:30pm, with 3-course tray options (appetizer, entrée and dessert) for just $16.82. Normally offered during regular lunch hours for $18.50, it's a fast, healthy, and affordable lunch option for the busy lunch-timers.